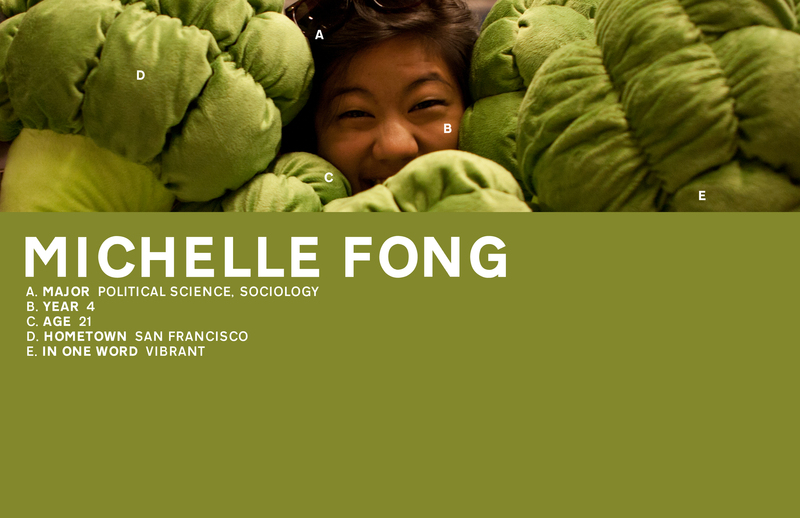 Michelle Fong, or McFong, is dedicated to providing opportunities for her fellow peers to better themselves, or giving them the opportunities to influence others. 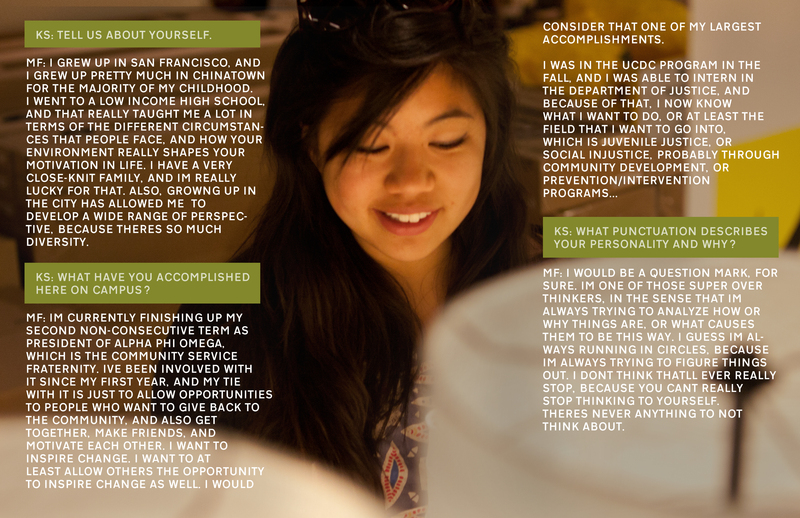 She puts a positive spin on everything in life, and is motivated by others’ views and perspectives. Michelle is trying to enjoy the friendships she’s made throughout college, the weather, and the people before she moves back home after she graduates. Find her writing and reflecting, and letting challenges and obstacles build her, not break her. 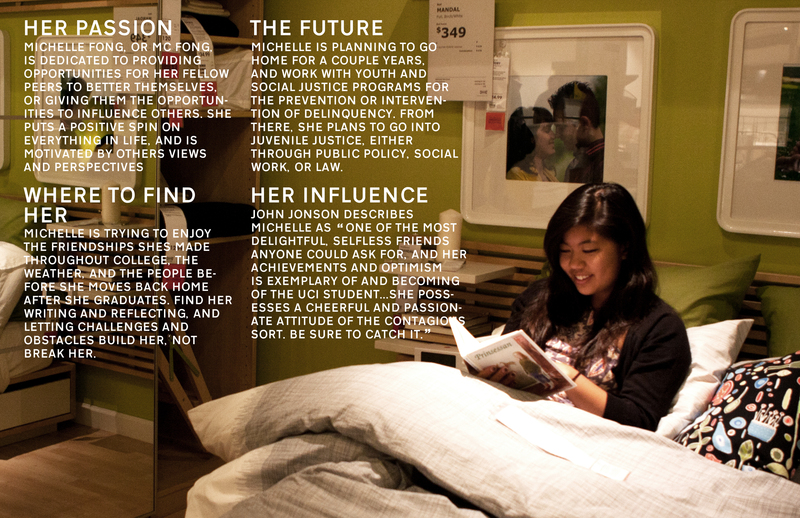 Michelle is planning to go home for a couple years, and work with youth and social justice programs for the prevention or intervention of delinquency. From there, she plans to go into juvenile justice, either through public policy, social work, or law. MF: I grew up in San Francisco, and I grew up pretty much in Chinatown for the majority of my childhood. I went to a low income high school, and that really taught me a lot in terms of the different circumstances that people face, and how your environment really shapes your motivation in life. I have a very close-knit family, and I’m really lucky for that. Also, growing up in the city has allowed me to develop a wide range of perspective, because there’s so much diversity. MF: I’m currently finishing up my second non-consecutive term as president of Alpha Phi Omega, which is the community service fraternity. I’ve been involved with it since my first year, and my tie with it is just to allow opportunities to people who want to give back to the community, and also get together, make friends, and motivate each other. I want to inspire change. I want to at least allow others the opportunity to inspire change as well. I would consider that one of my largest accomplishments. I was in the UCDC program in the fall, and I was able to intern in the Department of Justice, and because of that intership, I now know what I want to do, or at least the field that I want to go into, which is juvenile justice, or social injustice, probably through community development, or prevention / intervention programs. I think without that experience of being surrounded by an intellectual environment in DC, it probably would have taken me a lot longer to figure out what I want to do. MF: I think it’s the diversity among students, not demographically, but in a sense that there’s so many different people with different backgrounds here. When you talk to them, or with first encounters, they teach you about where people come from and what drives them. Just with that knowledge, you’re able to always self-reflect on what your values are, or where you’re trying to go, or what you’re trying to do. I think that’s really inspiring. I feel like pretty much everybody here has that thought process, like we’re all pretty smart – we’re all in college. We’re surrounded by people who are at the same level as us, and able to carry on a fairly thought-provoking conversation. With that, we get different views, and we strengthen or change ours, and in doing that, we develop more motivation. MF: I really do love politics. I like the decision-making process, and how to articulate yourself – that’s always something I’m trying to work on. My fraternity has definitely helped me develop that passion -providing the opportunity for people who want to make good change. I feel like a lot of people don’t reflect upon who they are, and in doing that, they don’t strive to be better people. That’s kind of what the problem is for me – I wish people had more passion, because if they did, maybe it would be a better world. There would be people always striving to improve or change things. When you try to change yourself for the better, you’re changing the world for the better. I think a lot of people don’t really connect those dots. They don’t need to think about it, but they should. KS: If you could describe your personality with a punctuation mark, which would you be, and why? MF: I would be a question mark, for sure. I’m one of those super over thinkers, in the sense that I’m always trying to analyze how or why things are, or what causes them to be this way. I guess I’m always running in circles, because I’m always trying to figure things out. I don’t think that’ll ever really stop, because you can’t really stop thinking to yourself. There’s never anything to not think about.